It’s really hard to pinpoint a specific moment of Michael Chopra in a Cardiff City shirt that I would label my favourite. There’s that goal against Swansea, his ‘boot on fire’ celebration against Bristol City (more on that to come), his famous song and so much more. Chops really is one of my favourite all-time Cardiff City players. I even named a Guinea Pig after him when I was a youth. He was as clinical a finisher as you’re likely to see, up there with the likes of Robert Earnshaw in a Cardiff shirt. Tap ins were his trademark, with the intelligence to be in the right place at the right time. My favourite Chopra moment came in 2007, though. It was his first season in South Wales and he had already become a fan favourite. There was an element of cheek to accompany his quality on the pitch, which certainly endeared him to the City faithful. It was quite a season. Joma made our kits. Dave Jones was manager. Sam Hammam sold the club to Peter Ridsdale. Michael Chopra finished top goalscorer with 22 goals. I want you to fast forward that season to the 17th of February. Leeds United at home. It was a much anticipated game, as they always are against Leeds ever since that famous 2002 FA Cup win. City had won the reverse fixture 1-0 thanks to a Willo Flood goal. 13,276 people packed into Ninian Park and the game was tight. The game approached half-time and City won a free-kick on the edge of Leeds’ penalty area. Up steps Chopra, pulling rank over free-kick specialist Peter Whittingham. He strikes the ball perfectly, lifting it over the wall and into the top left corner of the net. City win the game 1-0, but not before both Chopra and Simon Walton received their marching orders. It was perhaps not Chopra’s greatest goal. Neither was it City’s most electric performance, but it sits nicely in my mind as Chopra rarely enters the mind when thinking of City’s free-kick maestros over the years. He could do everything. 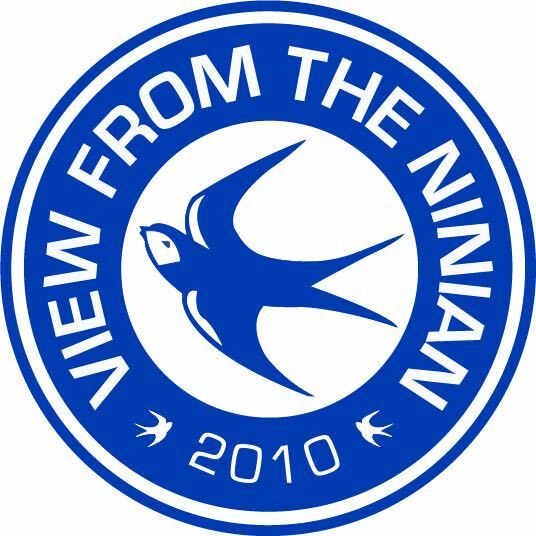 Cast your minds back to Tuesday 26th January 2010, as Cardiff nip across the bridge for the Severnside derby. They returned with three points, six unanswered goals and major bragging rights. Cardiff fielded Michael Chopra, Jay Bothroyd and Ross McCormack and blew Bristol City’s house down. Chopra, as was often the case, stole the show and bagged a brace. After one of those goals, he celebrated a little too close to the Bristol bench and Gary Johnson, a good friend of opposing number Dave Jones, stuck a foot out and tripped Chopra over, who was straight up and in his face as a melee ensued. It was a funny moment and produced a great image, but it was also vintage Chopra; winding people up, getting in their faces, but most importantly, letting his feet do the talking. The fact that this was against a fierce rival made it more iconic, but Chopra made a habit of turning it on for the big occasions. The more at stake, the more he puffed out his chest. It’s not a quality you can teach, its either in there or it’s not. Chopra had it and loved showing us all. Paul Gronow – A chance for Chopra to win it…. It’s the 3rd of April 2010, my first marriage is on the rocks and I’ve gone to the football for some much needed relief. Cardiff City are flying high in the table and facing a spritely Swansea side who are looking to pip the Bluebirds to promotion to the Premier League. After the Swans take the lead from the flukiest of corners (followed by Wales captain Ashley Williams launching the ball into the Canton Stand), the Bluebirds hit back with that classic “big man-little man” combo. Jay Bothroyd nods down for Michael Chopra to equalise in front of the travelling Jacks. Beautiful. Roll on the last few minutes and David Marshall SOMEHOW saves a point blank header for Shefki Kuqi. Cardiff City make a last-ditch attempt to win the game, as Adam Matthews (remember him?) takes a throw in level with the 18 yard line. Aaron Wildig (bonus points if you remember him too) manages to somehow nod the ball back into the box. EVERYONE runs out except for Michael ruddy Chopra who gambles (no pun intended) on the ball coming back into the area and is left one on one with Doris De Vries to win the game. At this point I shut my eyes ( I think). The next thing I know, the CCS erupts as Chopra wheels away having won the South Wales derby. Grown men cry and so do I. That may have been the best birthday present I ever had. I love you Michael, thanks for the memories. For those of you wondering, my first marriage was about as successful as the Bluebirds’ promotion attempts under Dave Jones. Much like Cardiff mind, I moved on to better things. I associate Michael Chopra with hat-tricks (perhaps generously) and my favourite is the one against Leicester in 2007. He’d been in a bit of a goal scoring drought and the club had even gone goalless six times in a run of games between the end of December and mid January. Finally it all clicked again as Chopra almost single handedly put City back in the playoff places. The first goal was a sweet free kick rifled in down the Canton end to put us 1-0 up. In the second half Joe Ledley split the defenders with a beautiful long pass, setting up Chopra for an audacious lobbed goal to make it 2-0. For the third he turned a defender inside out and then curled one past the keeper from the edge of the box: 3-0. Leicester actually scored two to make it a nervy finish but City held on. Chopra absolutely took the piss on a cold afternoon and revived City’s (ill-fated) promotion campaign. How good was the hat trick? Good enough that people rarely agree on which goal was best and FourFourTwo rated it the 11th best hat trick of all time.